Anybody else catch that awesome new trailer for Annabelle: Creation this week? This one looks leaps and bounds scarier than its predecessor, Annabelle. The Annabelle doll is creepy on its own, but does anyone else think that there must be something seriously wrong with these people that they think these dolls will be cute little additions to their children’s rooms? In honour of our little buddy Annabelle, here are 5 other movies about creepy dolls that you might enjoy. I have to admit, I didn’t have really high hopes for The Boy. Then, when I started reading some reviews, I saw that the common denominator was that people were completely divided by the ending. I really enjoyed the ending, and thought it was a total breath of fresh air. It was also extremely creepy when you go back and put that piece of information back into previous scenes that were already pretty unsettling. The doll in question, Brahms, is really off-putting in that he looks more like a child than a doll. He personifies what, to me, makes the killer doll really scary – that you know they’re up to something, but because the expression never changes, you don’t know what. Ah, killer puppets. Lots and lots and lots of puppets. Puppets with names like Decapitron, A bit cheesy for sure, but this series is nothing if not creative. The other surprising thing is that as you continue to watch through the many, many sequels, the puppets are not always the bad guys. Blade is by far the creepiest with black pit eyes that have blades that pop out, and a knife and a hook for a hand. These little toys were creepy before they were animated by some evil spellwork. The cheese factor only makes them more entertaining, and the series has spanned 11 movies so far (soon to be 12!). This gem starring Anthony Hopkins and Burgess Meredith is a truly unsettling film. Anthony Hopkins is a magician who features a ventriloquist dummy, Fats, in his act. As the film goes on, it becomes more and more obvious that perhaps Fats is really running the show. A great psychological horror movie, this one should be seen my all horror fans, or any fans of Anthony Hopkins who haven’t seen much of his earlier work. Ventriloquist dummies (insert shudder here). I am positive that I am not the only one out there who was traumatized by Slappy the dummy in the Goosebumps series as a child. Billy, the main wooden terror in this film, reminds me a lot of Slappy in appearance. The town crackpot, Mary Shaw, lives alone with her little army of puppets. After an unpleasant death, Mary Shaw continues to terrorize the town as the little monsters rip out the tongues of their victims. This is James Wan’s lesser known follow up to Saw. While it is not his best, the creepy doll factor is high in this one. Like anyone is surprised that Chucky would be number one. Watching some of the later horror-comedy entries in the series like Bride of Chucky and Seed of Chucky, it is easy to forget that Chucky started out as one of the most sinister scary dolls around. 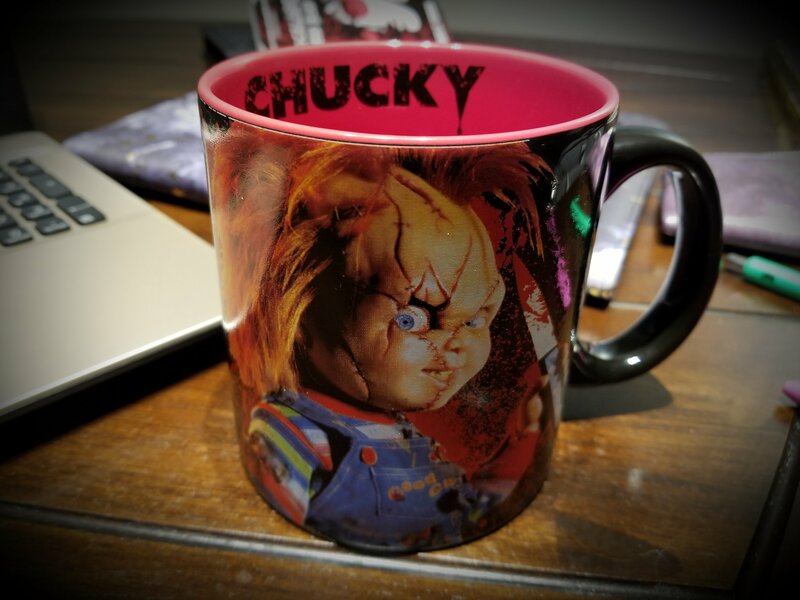 I still remember the first time I saw Child’s Play, and that scene where Chucky suddenly comes to life in Andy’s mom’s hands scared the CRAP out of me….there was little sleep had that night, I can tell you. With a return to making Chucky scary again in the more recent Curse of Chucky, I am definitely looking forward to the upcoming Cult of Chucky. Enjoy! Just remember to put away any dolls and action figures before you watch…..